Chennai: The College Bazaar was conducted by Centre for Social Outreach and Karunya School of Management in collaboration with the Tamil Nadu State Rural Livelihood Mission. 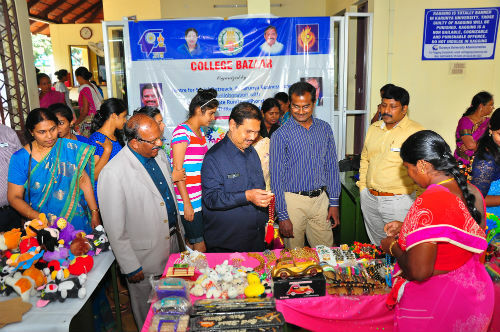 The College Bazaar gave a platform to display the products of Selp Help Goup Women Entrepreneurs from Coimbatore and Various Districts of Tamil Nadu. There are 45 women Entrepreneurs who displayed their manufactured products like Wooden Toys, Fashion Jewellery, Key chain , Dolls , blankets , pickles . The tribal women group from nearby forest village also participated in the bazaar by displaying vey rare medicinal herbs for cosmetics and medicinal purpose. The bazaar was unveiled by the Vice Chancellor Dr.P.Mannar jawahar and Inaugurated by Mr.D.Ramamoorthy , I.F.S (retd) Director of Trust. The Tamil Nadu State Rural Liveilihood Mission , Project Director Mr.K.Selvarasu of Coimbatore Districtwas the Chief Guest for the program. Mr.Tamil Maran, Head , Centre for Social Outreach of karunya coordinated the program. In the Chief Guest address by Mr.K.Selvarasu highlighted that the Tamil Nadu Govt conducts the College Bazaar throughout the year in various colleges to popularize the rural products of women entrepreners and also to market the produces made by them. The products manufactured by the self help group wmen are sold to a cheaper price to malls and they display it for a higher rate. The products in the exhibition are manufactured by the women below the poverty line. In the Inaugural address by Mr.D.Ramamoorthy he mentioned that for Karunya it is a great opportunity to host the college bazaar in the university. Women are equal in entrepreneurship and proved to be strong. There are several psychological, physical, financial and technical problems being faced by the women entrepreneurs . The Karunya University will help the women entrepreneurs by training them in various skills, explore market avenues. The vision of Karunya university is to provide solutions to the existing human problems . The sales for the two days was rupees four lakhs which goes directly to the women entrepreneurs.